I heard the quote in the title of this blog as a young pilot many years ago. A World War II pilot radioed that report in –he had no idea where he was, but he was making great progress somewhere. As a stewardship consultant working with our congregations, I sometimes feel as though that quote is with us. Numbers can seem dry, but they can tell important stories about our our communities. It’s hard to know where you are going if you don’t know where you are. There are statistics that I believe leaders should know if they are to understand their congregations. 18 data points and 1 more to ignore. I know what you are thinking “18! Is he nuts? Who has all that data and what would we do with it, anyway?” Bear with me – this is a conversation worth having. 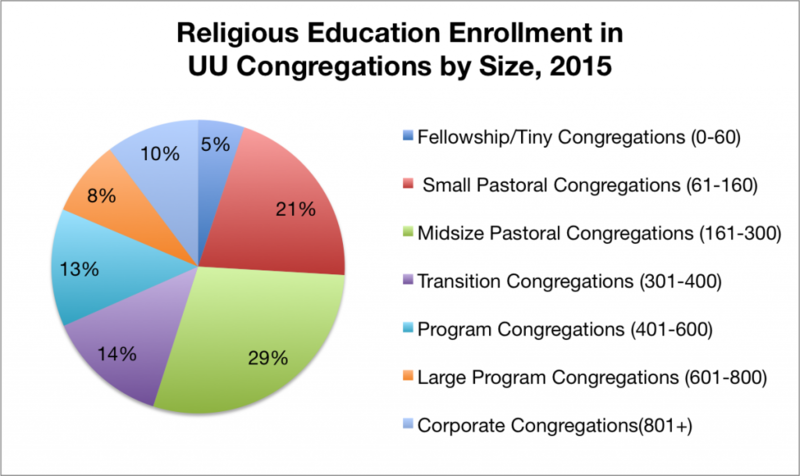 The first 10 of these data points almost every congregation has readily accessible. Not enough leaders and members consult them sometimes, but they are easy to generate. The next 7 take a little effort to generate, but the returns can be impressive for congregations of just about every size. In the interest of brevity, this blog will only list the 19 – you can read the expanded version on the Stewardship for Us blog that provides key aspects on each data point, for those interested in knowing more and seeing how these work to make a whole picture. The only data point discussed here is one to be ignored. Sunday attendance, RE Attendance (Adult and children’s RE). Percentage of budget provided by pledges. 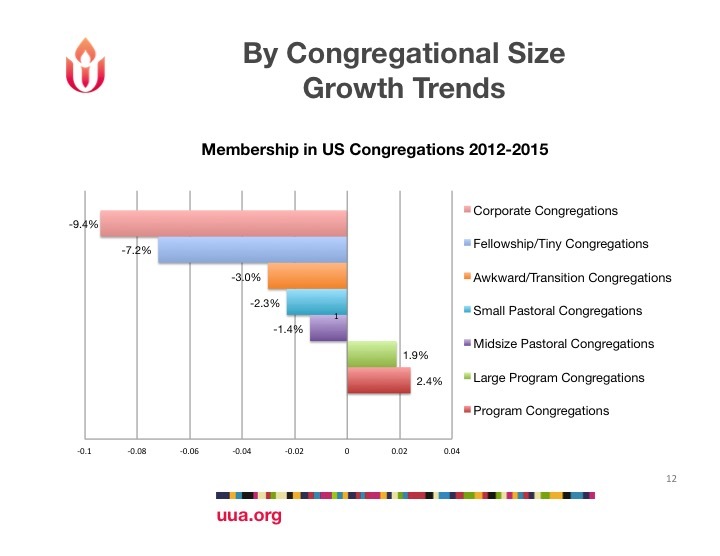 “Average cost per household” to run your church. Percentage of members pledging, if your bylaws do not ask that of all members. Mean (average) and Median (1/2 of pledges are larger, ½ are less) pledge. Number of households that have a pledge/contribution waiver. Percentage of households/members that are not pledging, only making a Contribution of Record (COR); mean and median COR. How many are new pledgers (first 2 years)? Mean and median of new pledges? Families active in RE and their distribution among pledges and COR population? Where is your Board in Fair Share Giving and quartile distribution? Percentage increase/decrease in total pledges/mean/median on last 3-5 years? When was the last time you employed Visiting Stewards, with good training? 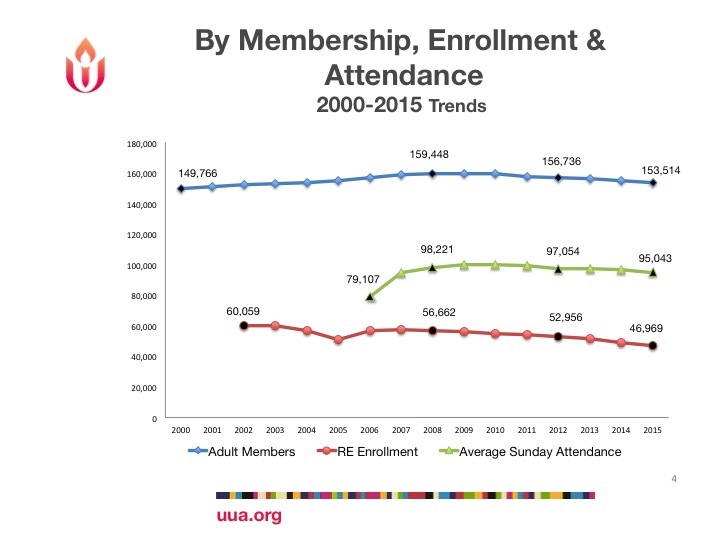 NO-How much of a pledge goes to “UUA dues?” This pops up often, and its harmful. We do not pay “dues;” clubs and fraternities do that. 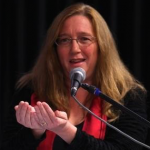 We make contributions to resource the work the Regions and the UUA do in our name. 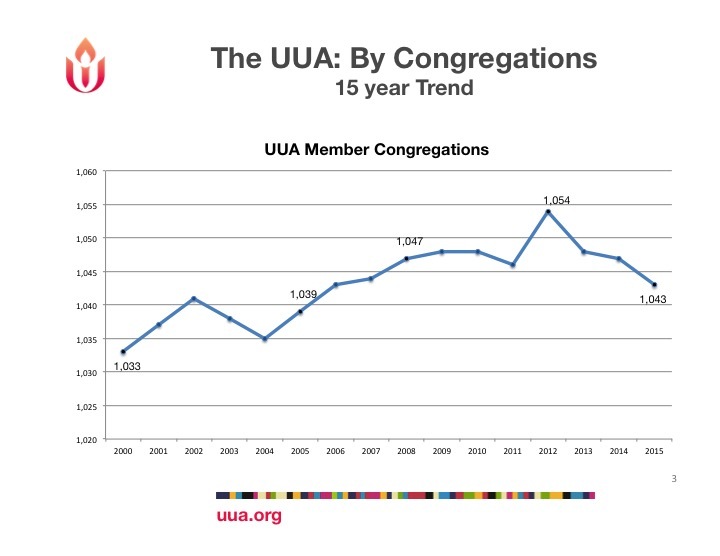 Congregations sometimes ask that a pledge be at least at the level of their per member contribution to the UUA. 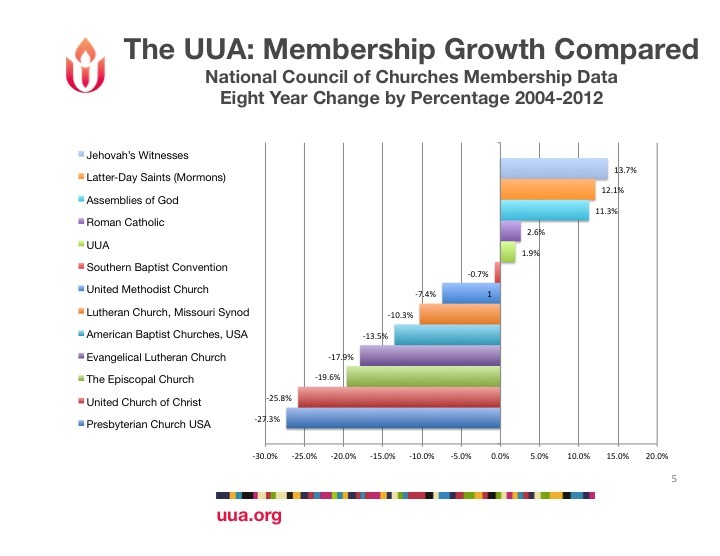 This makes our contributions to the UUA into an outside burden. Being a member of this association is an integral part of being a UU – don’t treat it as something outside our community. Encouraging pledges at this low level also assures that whatever funds are contributed do not support the congregation locally in any way. Bill Clontz, Stewardship Consultant with the Stewardship for Us Team. 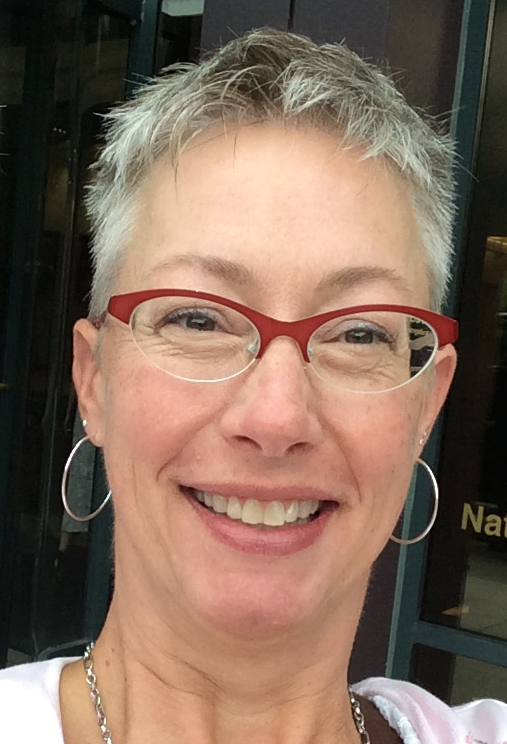 has been a stewardship consultant supporting the UUA for over five years. He brings over forty years in leadership development and coaching, organizational effectiveness, and strategic planning to this work. He has over 25 years of active participation in UU church leadership and stewardship and 15 years of business development and portfolio management as a corporate officer, including working with nonprofits and nongovernmental organizations. Bill has served in his own congregation in a wide range of positions and he is a regular presenter at UU Regional conferences and the UUA Annual General Assembly. 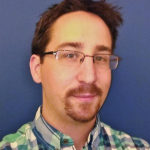 His focus as a stewardship consultant over the last five years has been empowering congregations to have successful stewardship environments, leadership development, and the growth of our movement. 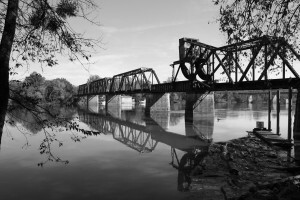 The sister Unitarian Universalist congregations of Augusta, Georgia and Aiken, South Carolina straddle either side of the Savannah River. But the fact that they are in different states hasn’t stopped the spirit of collaboration that has existed since they were formed within months of each other in the early 1950s. The Aiken Unitarian Fellowship was formed first in 1953, and after Unitarians in Augusta decided to start their own fellowship in July of 1954 they carpooled their children to Aiken (18 miles away) for Sunday School until 1956; in 1958 Aiken children began to travel to Augusta for Sunday School. All the while there was joint participation in cluster and district events, and Liberal Religious Youth retreats; but in 1974 the Aiken Fellowship disbanded and the deed to its property was given to Augusta. The funds were used as collateral to obtain a building loan for the Augusta campus to expand. In the early 2000s the Rev. Dan King, minister of the Unitarian Universalist Church of Augusta, supported UUs in Aiken in reestablishing their own congregation. The Augusta board facilitated financial arrangements until the Aiken congregation could handle them. Several years later, the Aiken Unitarian Universalist Church decided to pursue the goal of becoming a minister-led congregation. As a lay leader of the Augusta congregation, I occasionally spoke at Sunday services in Aiken. I then had the honor of serving as a half-time minister of the Aiken church during my internship years. I was ordained by both congregations before being contracted by the Augusta congregation as its full-time Developmental Minister in 2013. My Minister’s Study is in the office block built with the funds donated by the Aiken Fellowship. 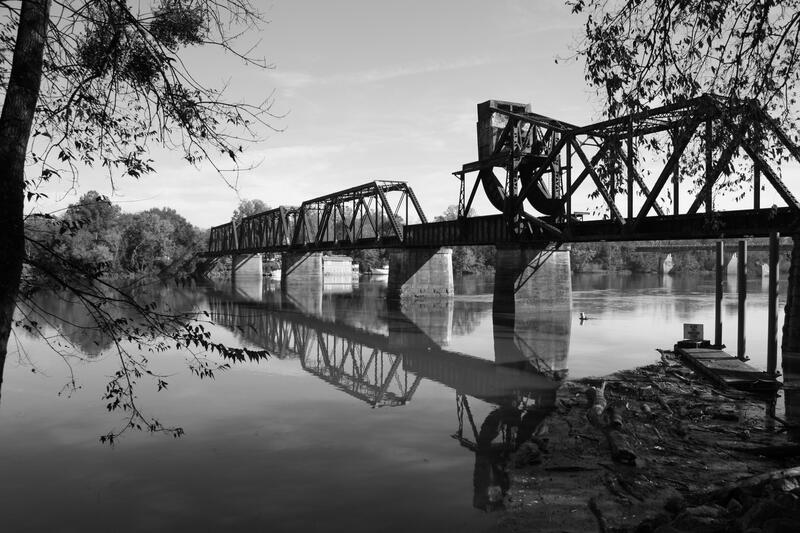 The 60-plus years of collaboration between Aiken and Augusta has made me the minister I am today. The Aiken congregation is in its second year without a minister; its leadership felt it needed to do something to further its mission and maintain its energy and credibility in the community. So last year the Aiken board proposed to the Augusta board that the two congregations (Augusta has 150 members, Aiken 60) explore ways to work together in partnership to our mutual benefit and to the benefit of the larger Augusta-Aiken area. Going forward, we have agreed to assist each other internally within our congregations, and to promote our shared values in our communities. Our liaison team met for the first time in July, and our boards had a joint potluck and consultation with our Southern Region Congregational Life Staff member, the Rev. Carlton Elliott-Smith, in September. He challenged us to ask what we can do together that we can’t do separately…and that has opened up lots of possibilities! In addition to training Worship Associates for both churches, swapping occasional speakers (and me) for Sunday services, and both social justice committees staffing a joint stall at the Augusta Pride festival, we are stepping up collaboration in the coming year to include a joint women’s croning ceremony in December and a new Coffeehouse series, which will be organized by a joint committee and held at the Augusta campus. We also will be off to The Mountain Learning and Retreat Center for a joint congregational retreat in April 2016. Charge the boards to turn those opportunities into action. Rev. Gaye Ortiz, a native of Augusta, Georgia, serves as Developmental Minister of the Unitarian Universalist Church of Augusta. She adores her five grandchildren and great-grandson Oliver, and she believes that the Atlanta Braves will one day again win the World Series. Happy Friday! It’s time for some numbers. 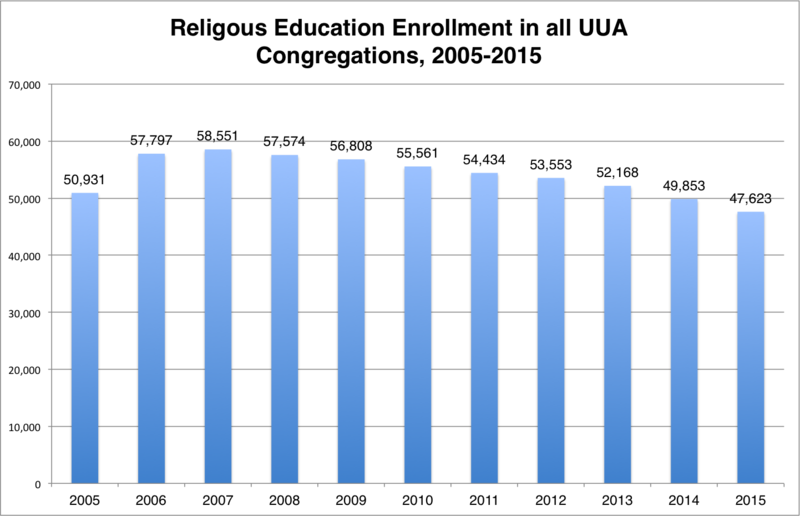 This is the beginning of a series on Religious Education Enrollment. 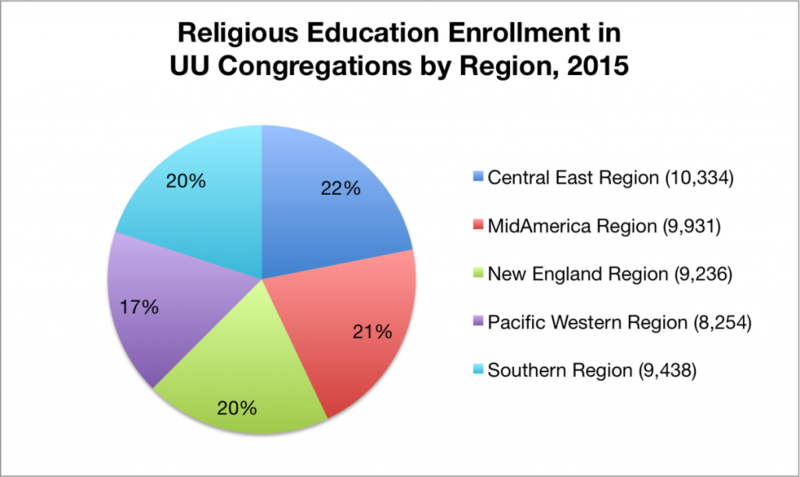 These are self-reporting numbers by UU congregations in the United States representing the number of children and youth enrolled in their religious education programs. I break down the congregations by 7 different sizes, because I primarily prepare analysis for Congregational Life. I’m a practitioner supporting the work of other practitioners. We recognize that each size category has special needs and characteristics. Deepening Faith: How Can We Reverse The Trend? Our survey showed that youth want greater ways to connect with their congregation. We know that one of the major markers of future religious participation is increased connections between adults and youth. The National Study of Youth and Religion tells us that 81% of youth have never shared a personal problem with a member of their ministry team. 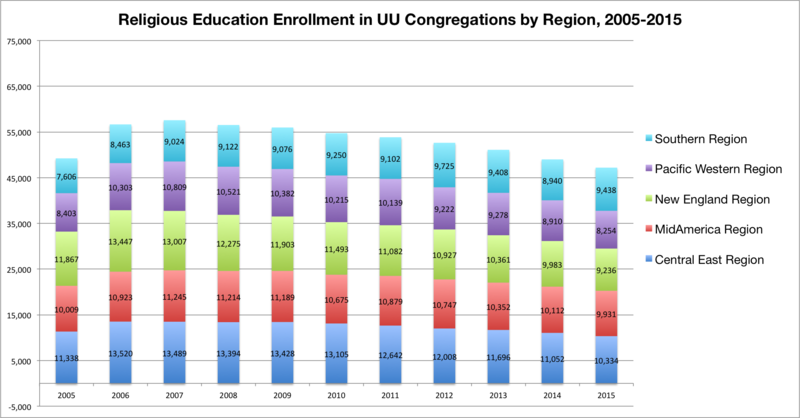 Anecdotes from Unitarian Universalism lead us to believe that the vast majority of pastoral care for youth in our congregations is provided by other youth. At General Assembly, our Youth Media Volunteers asked their peers to share their personal UU history. 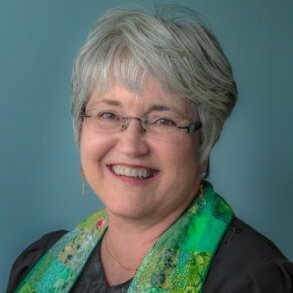 Almost every response began with some form of “I have been a member of my church since I was two” or, “My family has been members since before I was born.” For those who grow up in a congregation, who grow up in Unitarian Universalism, they are innately invested in their congregation. A large number of our youth go through intensive UU identity curricula like Coming of Age and Our Whole Lives. They claim membership because they are invested deeply in their congregation. From Almost Christian, “The more available religiously grounded relationships, activities, programs, opportunities, and challenges are for teenagers, the more likely they will be religiously engaged and invested…Stated negatively, churches that do not invest in their youth find that youth are unlikely to invest in them” (203). From our survey, youth want “more opportunity for youth leadership” and “[more] teen-based sermons.” Youth are members of your congregation just like any other and they have needs that need to be met as well. If you invest in your youth and their leadership, there will be an exponential growth in volunteer capacity. For a large majority of our youth, when they tell someone they are UU they get this look. 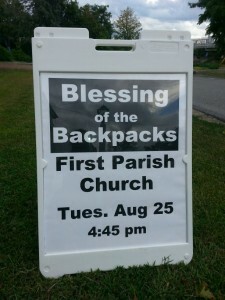 A great way to break that trend is for your congregation to show up in your community. Your youth will join you on the frontlines because challenging racism, homophobia, transphobia, sexism, and ableism is important to them. They and/or their friends face oppression every single day. Already doing justice work in your community? A service trip is a great way to deepen youth’s faith. Share: Our more in-depth Youth Ministry Survey with the youth in your congregation! This time, we are more interested in how youth connect with UU theology and values. By the Numbers: where’s the growth? Yes, you read that correctly. There is a category I call “Awkward” — it’s the hardest size to breakthrough. A couple years ago I asked leaders of congregation in that 301-400 bracket if the name was offensive. Most laughed and said, “no, it’s actually pretty accurate.” There is a Facebook group for the two smallest categories called “Small & Mighty.” There are just somethings that only congregational leaders in your size category will understand. It’s good to compare notes, share ideas, learn from the challenges and celebrate the blessings. Don’t panic about our largest congregations. The majority of them got real about what it means to be a member of their congregation and “cleaned the membership books.” I see this as a strong sign of organizational maturity. These two graphs really hit home what a difference the time span you’re looking at can make. Rev. 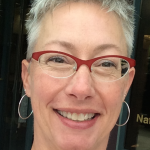 Tandi Rogers spends about an eighth of her job researching and analyzing data on behalf of the UUA Board, Leadership Council, and Congregational Life staff. 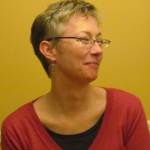 She also serves on the Faith Communities Today interfaith consortium of religious data geeks. Don’t Do It the Night Before School Starts: We scheduled it for two nights before. Many families hadn’t seen each other since June. We had at least one new family who came so that their child could meet peers and have them be familiar faces on the first day of school. Include Dinner: We planned it so that folks could eat (pizza; we asked for donations, but the church covered some of the cost) and then go home in time for the littlests’ bedtimes. We did ours 4:45 – 6:00pm. This may need to be adjusted based on your community’s rhythms. 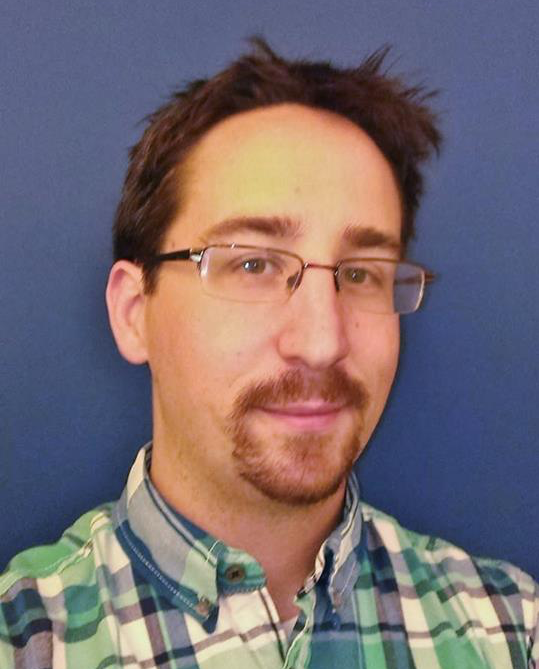 Outreach – Early and Often: We had a save the date in June, but knew few would remember. Article in summer newsletter. Public Facebook event. We specifically asked some congregants to talk it up on their Facebook profiles, both to increase knowledge about the event and excitement. In the last two weeks, we upped activity on Facebook around the event. Use of visuals on social media is a must. For us, the most widely shared visual was a photo of our Main Street sandwich board, which ended up being shared over 1,700 times on Facebook! Go figure. Inclusive Language: Since we were using school as a reference (“school is just about to start”) we were sure to reference those who are homeschooling. We also decided that to invite as much multi-generational participation as possible, we also included the School of Life – thus making it clear that anyone could receive a blessing. We did it outdoors. 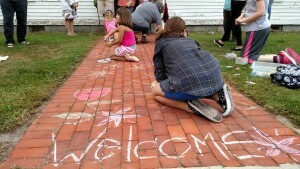 Sidewalk chalk to keep kids and adults busy as we prepared to start. 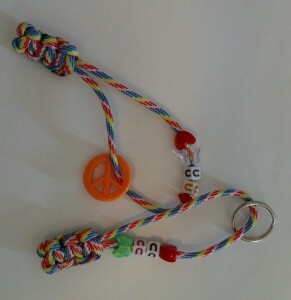 Kept kids joyfully occupied, parents happy. of the summer by singing a silly camp song — enough of the kids knew it so they took over leading it. Asked youth to sing and we assigned official blessing duties to the Coming of Age class. We blessed not only backpacks, but all sorts of items including invisible (AKA forgotten at home) backpacks, briefcases, gym bags, cell phones, wallets, and shoulder of humans standing with us. 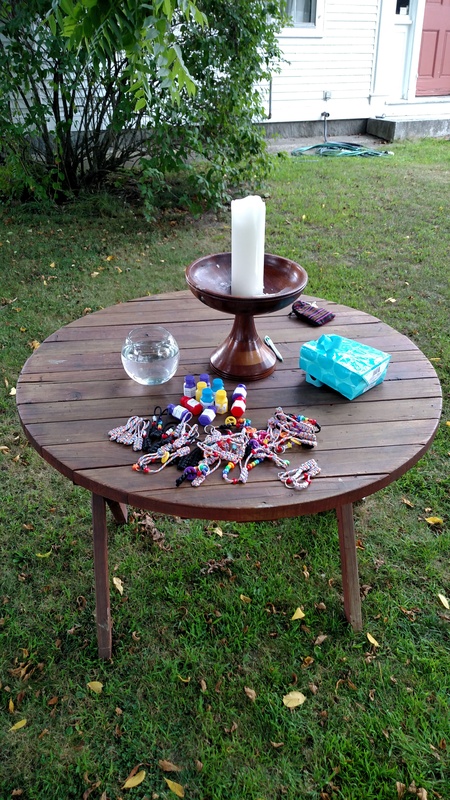 We handed out talismans — a HUGE hit: combining symbols of peace, or beads that said “UU” or the name of our church (our church initials, “FPCOG”). Even when you are away from First Parish, you carry the heart of Unitarian Universalism with you wherever you go. May you feel curiosity all your days. May your imagination catch fire. May you find courage when it is necessary. May confusion lead to better questions. May you feel compassion toward those around you, and they towards you. May you feel heard and seen; may you hear and see others. May you speak up for those who are not heard, who are not seen. You are welcome and encouraged to borrow any part of this –change it up to make it your own. My only request is that if you are going to use the words of our blessing in print (hard copy or online) that you attribute them to me, Karen Johnston. 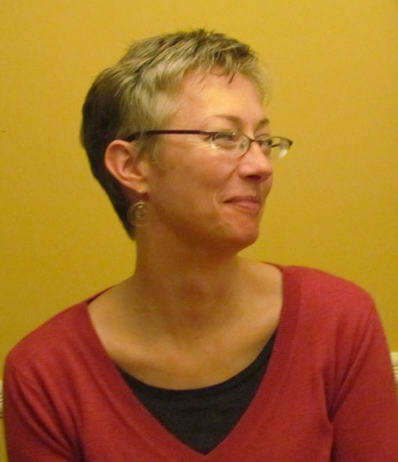 Karen G. Johnston is the Intern Minister at First Parish Church of Groton from 2014–2016, serving in a part-time capacity as she finishes her Master of Divinity studies at Andover Newton Theological School. By The Numbers: but are we growing? it’s Friday! Time to snack on data. 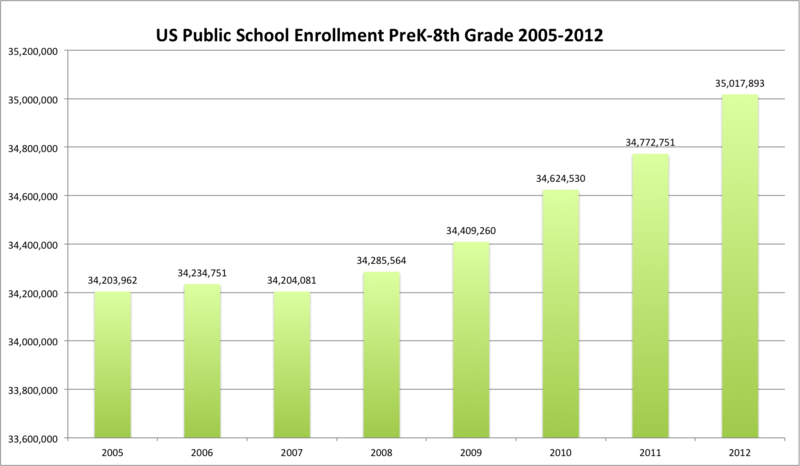 I’ve been deluged with the question — But are we growing?! Now, dear ones, you know that there are many indicators to growth. Impact is really the growth I’m most interested in. We’re working at fine tuning some data collection at the UUA to better measure impact. Until then, we classically measure by membership. Don’t get distracted with the squiggly line – On a larger scale it looks like a flat line growing by 1% over 15 years. Interesting fact — Currently we have 1043 active congregations world-wide. 2% of our member congregation and 2% of our adult membership are abroad. 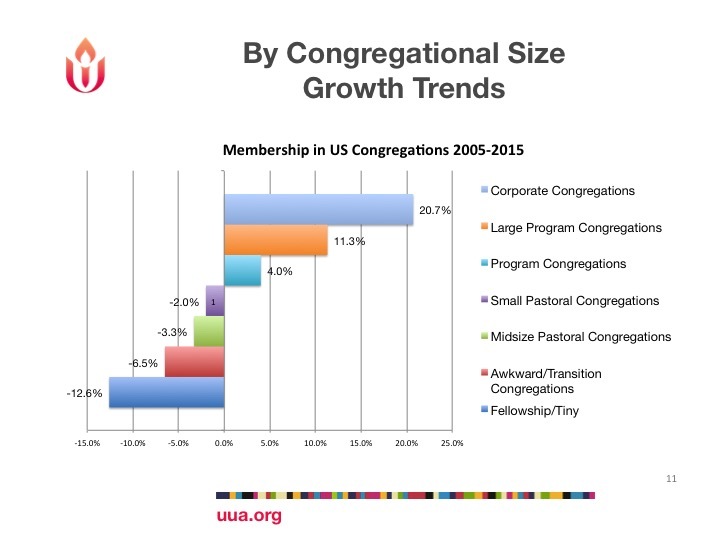 This represents active congregations for the year indicated belonging to US regions and CLF. 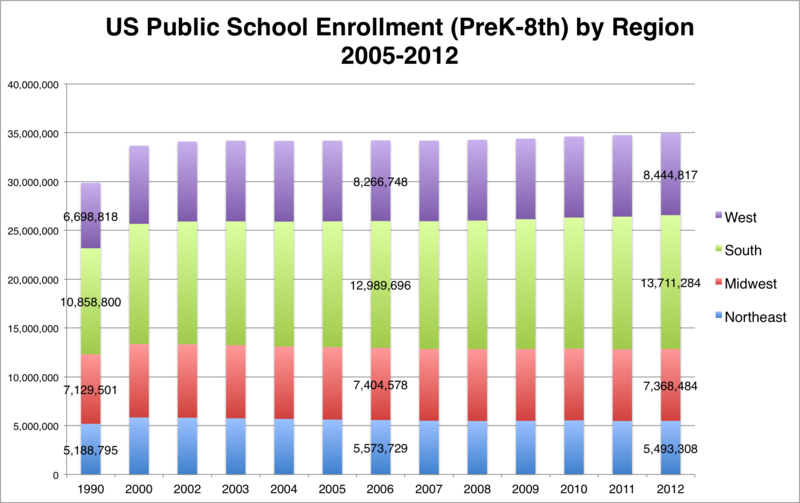 Religious Education is dropping significantly. And this is a ministry we are known to do well. Your Congregational Life staff and the Liberal Religious Educators Association are alarmed, too and trying to figure out what this means for us. When I was with my research counterparts in August we were all wringing our hands about the decline in children and youth. It’s everywhere. The yearbook with the above data only comes out every-so-often. This is the most current data we have available. I see opportunity. Many folks are leaving main-line Protestant traditions because of their behind-the-times stance on gay marriage and other liberal issues. We’ve got that. In spades. My question is how welcoming will we be to folks coming from other religions who don’t want to leave all their religious language and practices at the door? Will we make room? Will we be open to be transformed ourselves by expanded community and increased diversity in beliefs? May we make it so!